The links between art and fashion are at the forefront of debate recently with the launch of the major book on this subject, Art/Fashion in the 21st Century (published by Thames & Hudson) and authored by Brisbane's own Alison Kubler (with Mitchell Oakley Smith). 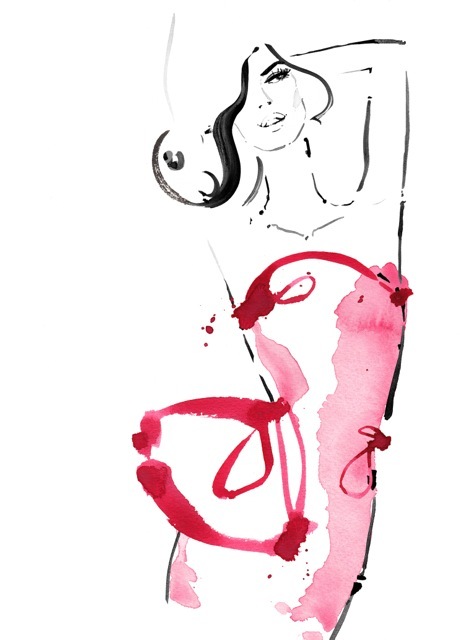 In another exploration of the art/fashion intersection, REDSEA Gallery hosts the first solo exhibition of artworks by fashion illustrator Kerrie Hess. Internationally known, with campaigns for Louis Vuitton, CHANEL, Harper's Bazaar, Alexander McQueen and Kate Spade New York under her fashionable belt, Hess has recently returned to live and work from Brisbane. TUL had a chat with Kerrie Hess to find out how she cuts such a swathe through the international fashion industry. TUL: How did you become a fashion illustrator? I studied graphic design at Griffith University and then moved to London where I was a graphic designer for The Independent (newspaper). I have always done fashion illustration in my spare time. Illustration was just taking off in the late 1990s and it was something that I loved doing. One week a photo didn't turn up and I did an illustration for The Independent weekend magazine. My editor loved the work and suggested I do it more often. I gathered clients and took the leap eventually to do it full time. Even though I still love graphic design, illustration is my passion. TUL: Was it always fashion illustration? Yes! I love and adore fashion and illustrating it is such a pleasure. It was like creating my own job and, luckily, my work seems to have hit a chord. What I love doing has been my job for 15 years now. TUL: The key to illustration would be highly subjective decisions — about what to include and what to leave out — is that instinctive for you? Can it be trained? I believe that anyone can draw. I've been illustrating for a long time and I know when it comes to the proportions of the body, what I like to leave out or adjust. It comes down to practice and I think if the subject is something you enjoy you will do a better job. TUL: Has it been a long journey for you? I worked at The Independent for nearly two years and have freelanced ever since. When I began, illustrations had to be delivered by hand — it was before the days of email. Once the Internet was established it allowed me to work for companies all over the world as a freelance illustrator. TUL: What types of pressures go with working at the highest international level? There is pressure when you are working with a great client, although it is pressure you put on yourself to do a great job. Ultimately, the more I relax and enjoy the experience of the job, the better my work will be. A job that came up earlier this year was with Collette Dinnigan and Harper's Bazaar — to do the cover of the February 2013 issue of Harper's Bazaar — yet we only had 24 hours! I knew the press deadline was 5 am and I no choice but to start late. We worked long through the night together. I was emailing the sketches to Collette at 2 am and she was replying. I was up all night for the job — sometimes the time is very short. This year I also worked with PRINTEMPS Department store in Paris. The brief was to illustrate billboards and windows for the brand. That was such a thrill because PRINTEMPS is my favourite Parisian department store. I've always admired their windows and branding. TUL: Does pressure bring out your best work? Sometimes it does. I work with watercolour paint and brushes. It is a medium that is quite fast but either works or doesn't. I try to relax and enjoy what I'm working on — and then, nine times out of ten, it works out. It's a medium that is not completely controllable and sometimes the uncontrolled mixes in the paint become my favourite sections in the sketch. TUL: This is your first solo Australian exhibition. Do you have a sense of who your clients may be? 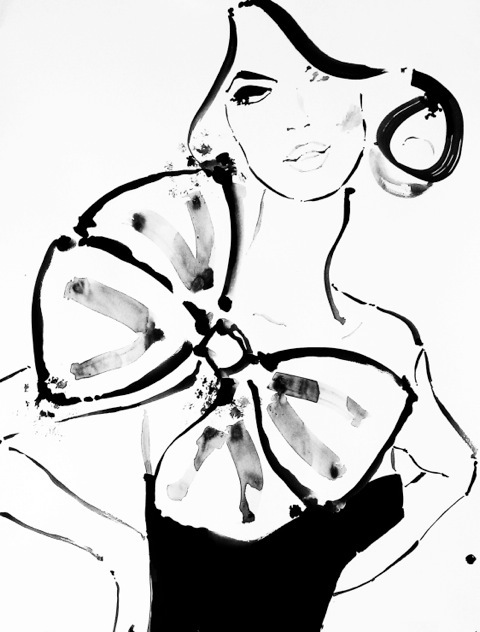 They are anyone who appreciates fashion illustration and enjoys old world glamour. TUL: What will the exhibition comprise? There are over twenty works in the exhibition. There are six large originals and a selection of limited edition prints — all work done for clients such as Laduree, Christian Louboutin, Collette Dinnigan and the cover from Harper's Bazaar. Those that follow my work may recognise some of these from the campaigns. TUL: What brought you home to Brisbane? I had been away for a long time, living in London, Hong Kong, Melbourne and Paris. It has been wonderful — yet I was craving properly setting up and being home. Brisbane's a really great city: I love the weather. It is really nice to be back in Brisbane and close to my family. TUL: Is your work and reputation such that you can work from anywhere? Yes — however the irony is that most of my clients are in Paris — more than when I lived in there. I travel there once or twice a year and I feel as though I have the best of both worlds. TUL: What is your next project? I am having another exhibition in Paris in January 2014. It is at the Le Maurice Hotel — Pablo Picasso and Salvatore Dali showed there during their lives. It adds a little bit of pressure! TUL: What is your favourite Brisbane pastime? Probably a Sunday picnic with friends in Bulimba or New Farm Park. TUL: What is your favourite Brisbane eatery? Harveys on James Street is great for breakfast and, as a lover of Italian food, Bucci is a favourite for dinner. TUL Note: Louise Martin-Chew is a freelance art writer based in Brisbane. Louise Martin-Chew is co-director of mc/k art (with Alison Kubler) and their current project is the integrated art program for the redevelopment of the Brisbane International Airport. Louise attended the Press Preview/Vernissage of The 55th Biennale di Venezia between 29 May and 2 June. For those heading into Venice, her advice includes: travel light, party in moderation, wear sensible shoes (you may be judged by your footwear, but there are kms to cover), develop a must-see hit-list, and go early to avoid queues.